Free Seeds by Mail – Organic and GMO Free! Get your FREE Seeds by Mail today! Free seeds by mail!! And they are free organic seeds to make this deal even better. 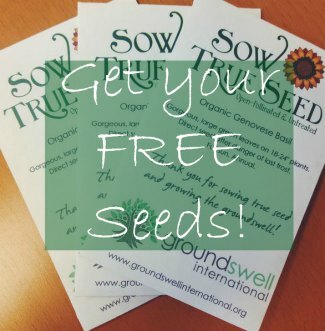 Groundswell International just launched their second annual Free Seeds by Mail seeds campaign and you can be a part of it! Last year they sent out free seed packets (I ended up with cucumbers). This year (2014) they are doing the same thing. I already received my free seeds this year (this time it is Organic Genovese Basil). You may receive a different type of seed. Generally there are three types of free organic seeds available. If you signed up in 2013 then they will automatically send you free seeds by mail in 2014. If you did not then you can head over to this page and sign up. Even if you are past the deadline, sign up so you are ready to go in March for their next annual free seeds by mail campaign. I did not even have to sign up the second year. The free organic seeds came automatically (via mail) to my house. These seeds are also GMO (genetically modified organism) free. If you are not sure what that means (or if it should matter to you) then head over to this page on Heirloom vs. GMO seeds and learn something new! Do you already have your free organic seeds? Here are some more resources to help you get the most of your free seeds by mail. Here are 10 Frugal Garden Tips so you can start your garden on the cheap. Free organic seeds + cheap garden tips = frugal food! I found my seeds germinate much better with a seed mat. A seed mat makes sure the soil stays a nice (warmer) temperature for your free organic seeds to germinate in. Just be sure to watch the water level as the warm mat will make the water evaporate more quickly. I use this Apollo seed mat because it was on sale when I purchased it. It works great and really increases the germination of my free organic seeds (and the seeds I purchase). I also use a seed starting tray. Once you purchase one you can reuse it year after year. I have made seed trays out of toilet paper tubes, newspaper, and other pinterest worthy projects and although they save a little money, you have to redo them every year (unlike a seed tray) and you can't move them around as easily as a seed tray. I like to move my seedlings in the sun when they start getting large enough, and back inside when I am done. That is much harder with a bunch of quickly decomposing homemade newspaper seed trays. Groundswell mailed out hundreds of free seeds by mail last year. The free organic seeds were also GMO-free and open-pollinating seeds. They also raised funds used to support a women's group to grow vegetables in Burkina Faso and for gardeners in North Carolina to have access to a community tool library. 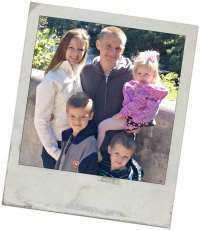 Groundswell International is a great group to support! If you would like to get more involved in the groundswell free seeds by mail program then there is information on the page on how to do that. They are also asking that you (if you want) share what you know about food and seed sovereignty or if you know of any initiatives in your own community that promote strong healthy seed systems. You can share via their facebook, instagram, twitter, or blog and all of those are also listed at the Groundswell International site. Here in Arizona Native Seeds promotes “strong healthy seed systems”. Native Seeds sells local GMO-free, open-pollinated seeds that are drought resistant. They also promote local foods (mesquite, prickly pear, cholla). Another way to get free organic seeds is the seed library. Native Seeds and the Pima County Library have paired to create the seed library. You can “check-out” seeds and then return or donate other seeds after your plants have grown. If you are in the southern Arizona area then please check out these programs. It is a great way to support local businesses and organic/local food practices. If not, check with your local library to see if they support a free organic seeds program. So, o get your frugal gardening, GMO-free seeds by mail! Happy homesteading! Click here to sign up for my mailing list and you will never miss the free seeds by mail program. What a great find! Thanks for sharing this. I am re-starting a garden that I let go last year and I’m always happy to accept some free seeds. You’re welcome 🙂 it is a great company and some really good seeds! Hi, what a great idea Miss Sally they also raised funds used to support a women’s group to grow vegetables in Burkina Faso its really nice sharing..! Great find indeed, thanks for sharing! I signed up too and hope im not too late.